"It's a canal, there'll be navigators too." "Woah" thought Mom, "there'll be alligators too." Just let me put a few arms around your waist." Else I'll put this stick about your back." "Right" thought Jim, "I shall blow a little hole." Mrs Marina Russell of Upwey, Dorset, sang 'Ware Out Mother in December 1907 to song collector Henry Hammond. 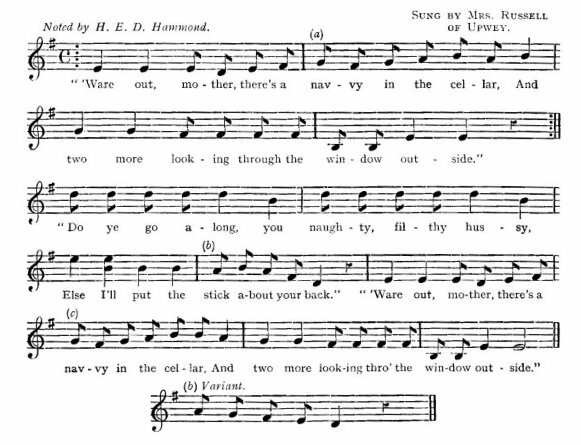 It was printed in the Journal of the Folk-Song Society Vol. 8 (1930). No more words were collected. Sam Richards and Tish Stubbs sang 'Ware Out Mother in 1979 on their Transatlantic album 'The English Folksinger'. It (one verse) was published in their folk song collection book of the same name (published by Collins, 1979, ISBN 000411068 4) where they stated that "Just this one verse was collected. We surmise on the evidence of countless songs collected since, especially from gypsies, that this was a piece of 'tuning' for dancing, probably step dancing. It may have been followed by verses of mouth music." Ian Woods and Charley Yarwood sang a much extended version on their 'Hooks & Nets' (Traditional Sound Recordings TSR 044 (LP, UK, 1984)). The credits for this track were given as 'Charley Yarwood/Trad'. The sleeve notes written by Charley state "Only one verse and one chorus of this song were collected from Mrs Russell of Upwey, by Hammond. Tom Brown gave me a photocopy of this fragment from the EDFSS Journal saying 'Do you want to do anything with this?' I did. The original may also be found in 'The English Folksinger' by Sam Richards and Tish Stubbs, who suspect that there may never have been any more; it being used interspersed with mouth music for dancing." This is the track you can hear on this page by selecting 'Play'. The Melrose Quartet sing the song on their 2017 CD 'Dominion'. In the sleeve notes they state that they learnt it from the singing of Charlie Yarwood. The CD can be purchased from their website.